One issue that's poised to dominate many aspects of food and agriculture this year is the debate over the role of meat in the modern human diet. This struggle strikes at the core of our omnivorous nature, while tugging at our heart strings, tempting our palates, challenging our intellects and presenting myriad health impacts. The more I learn about the impact the world's livestock practices have on world hunger, our changing climate and other facets of our environment, the more foolhardy and selfish eating animal products appears to be — unless, perhaps, you're raising or hunting your own, or purchasing from a livestock operation that's sensitive to its environmental footprint. By contrast, consumer interest in the quality of life experienced by the animals that provide us their meat, organs and secretions has spiked. The likes of Walmart and McDonalds are happy to oblige, having pledged to phase out their use of chicken eggs that were laid in a cage. Whether the chickens are truly any better off is an open question. Fortunately, in Charlotte, there are plenty of vegetarian and vegan options, and the list of totally vegan restaurants continues to rise — in addition to local mainstays Fern in Plaza-Midwood, Bean on Independence Boulevard, Luna's in South End, and ZiZi's in the University area, there's the new One Life Raw Juice Bar in Myers Park. More are sure to come. A growing supply of vegan products are also available everywhere from your neighborhood Harris Teeter to Bean's little in-restaurant grocery store. Not coincidentally, 2016 was the year the veggie burger came into its own, largely on the back of the Impossible Burger. 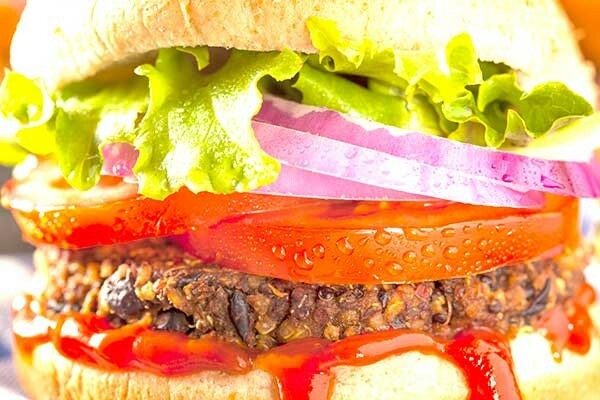 This plant-based, umami-rich burger sizzles and browns in the pan, and sheds plant-based red blood with each bite you take. Even the least apologetic of meat eaters surveyed have admitted to respecting the Impossible Burger, fortified with wheat and potato protein and lubed with coconut oil. The fake animal product space has also exploded with the likes of vegan cheese alternatives made from cultured nuts, pink-hued fake shrimp and crab meat, nut- and grain-based "milk" products like almond milk and soy milk, egg-free "mayo," and all kinds of vegan substitutes for egg, chicken and most every other piece of flesh or fluid you can imagine. It's not just vegans that are are into this stuff. Locavores, climatarians, ovo-lacto-paleo-bacon-vores, and good old-fashioned omnivorous are finding their way to animal product-free alternatives for entirely different reasons. Me, I eat meat. Mostly wild game, for which I feel zero guilt, assuming the hunt goes well. While I don't avoid animal products as a rule, for phlegm-related reasons I do limit my intake of mammal milk products. I know it isn't cool to admit it, but I like soy milk. I like milk, too. And heavy cream. And cheese, though I long ago settled on mayonnaise as my go-to cheese alternative. In recent years I've determined that Vegenaise, specifically the grapeseed oil formulation, is the best mayo on the market — and for reasons that are completely unrelated to the fact that it doesn't contain eggs. I scoop Vegenaise greedily upon my deer, my scrambled eggs, my beef or veggie burger, and I'm good. Bloodthirsty omnivore that I am, I'm part of the fake-animal-products market. "I'd say about 70 percent of our customers are not vegan and not vegetarian," Charlie Foesch, co-owner of Bean Vegan Cuisine, told Cretive Loafing in a recent story on the restaurant. The various animal products industries have not been pleased with these developments, and they pushed back in a big way last year. Unilever, owner of the Hellman's and Best Foods brands of mayo, took vegan food processor Hampton Creek to court for using the word "mayo" on the label of its egg-free mayonnaise substitute, Just Mayo. The National Dairy Council attempted, and failed, to make it illegal to use the word "milk" to describe nut- and grain-based milk substitutes like soy or almond milk. Makers of cultured nut products have similarly lost their ability to label their products as "cheese." It seems a matter of when — and not if — the beef industry goes after the Impossible Burger over its use of the word "burger." While many vegetarian diets often attempt to recreate animal products from plant-based ingredients, resulting in the likes of bleeding burgers and Tofurky, this is not to be confused with vegetable-based cuisine. Vegetable cookery doesn't carry the implicit inferiority complex that comes with constantly serving pretend meat. Rather, it celebrates the inherent qualities of the vegetable or plant part in question. So my prediction for this year doubles as a recommendation: don't sleep on plain vegetables. Even as you nerd out to a Silicon Valley burger-patty formulation that's precisely calculated to satisfy your body's nutritional needs while simultaneously saving the earth and tickling your taste buds, don't forget plain, normal vegetables. With each passing study, and with each passing year, vegetables continue to accumulate almost zero baggage. There's no debate over the pros and cons of vegetables, because it has been settled and confirmed. Vegetables are good and not bad. Luckily, one of the bigger food trends of last year will likely grow stronger in 2017: the push to sell imperfect produce, or so-called "ugly" fruits and vegetables, at a discounted rate. Like cage-free eggs, imperfect produce is available at Walmart. All due respect to vegetables, beautiful and ugly alike, but animals are not necessarily always bad. In fact, there is an increasingly solid argument to be made in favor of our eating them. Some of them, anyway. Public understanding and perceptions of fat continue to be turned inside out, especially relating to saturated fat, which has long been assumed to be the culprit behind obesity and related ailments, such as heart disease. Once practically unassailable, this position is now being openly questioned, as expert opinion is shifting to the camp that regards sugar as the primary dietary culprit behind obesity. And it isn't clear that all meat is bad for the environment, either. A vocal minority of ranchers are making the ecology-based case that certain landscapes can benefit from properly managed herds of certain ungulates. In the absence of buffalo and similar animals, many ecosystems could spin out of control without tasty grazers like cows filling that vital niche. Rotational grazing, if done correctly, can result in healthier ecosystems and carbon sequestration, proponents claim. It's a compelling vision, but even if it's true, the cattle-carrying capacity of the landscape is much less under rotational grazing than under feedlot rules. If the world were to make a dramatic switch to rotational grazing, it would mean a lot less meat to go around. But here's another prediction: the global cattle industry will not be switching from feedlots to rotational grazing systems anytime soon.